Open the file in the source editor and select "project|compile" or press Ctrl+F9. There is no progress indicator for now. If error occur there is no error message, simply nothing happen. Try to compile "CopyFresh.asm" or "examples\simple.asm"
- Added open files dialog. It allows open of multiply files at once. the information about filename is stored. - New messages in 'sourceeditor.asm'. Some messages behaviour is changed. - !!! The first compilation of Fresh with Fresh. Fixed some bugs. - About box edited - added last authors "decard" and "roticv". but for now is in "sources"
I've just seen it, and downloaded it. When i extract it, winrar says" No enough memory." 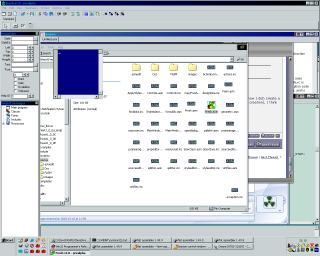 Proably something is wrong with your system, mine works OK. You can also extract it in WinCommander. 1. When compiling empty sourcefile, Fresh crashes. ; hOldString - old handler. if <> 0 DelStr is call to free memory. ; Return: handle of the new created string. And sourceeditor.asm, palette.asm and opendialog.asm call it without any arguments. I even wonder if we need hOldString at all, maybe I should remove it and make StrNew simpler? 3. There is still a bug when creating new sourcefiles with invisible source editor. I've got some question about form library: how to make some control in dialog focused when dialog is shown? I know comments are welcomed, so here are mine. 1. The icon shown in the taskbar or whatever you call it differs from the one shown on the top left hand corner of the window. 2. Somehow I do not like the color of syntax highlighting and the font used. Can't wait for the options dialog to be fixed so that I can change the font and the font color. 3. In the add class name dialog, the ok and cancel button are covered. 4. Somehow I would prefer the Main window and source window together as one, though I know it would be difficult to change the foundations of it. Perhaps something to consider. Other than the above comments I would like to say that I found fresh cool. Keep up the good work, JohnFound and the rest of the team. 2. And sourceeditor.asm, palette.asm and opendialog.asm call it without any arguments. I even wonder if we need hOldString at all, maybe I should remove it and make StrNew simpler? 1. I will check this. 2. You are right, my fault. I will think about StrNew. Just now I have no opinion. 3. I can't understand the point. Please explain more detailed. About focused control in the TForm, it needs fixes in the forms library, the procedure that creates the form. I will make it these days. 1. This is not a bug, this is feature. . The icon (and title) on task bar is icon of the TApplication window. 2. This will be fixed very soon. 3. This dialog is still in very early test form. Actually I use it as test window for forms library and it does not do any useful thing. 1. Small bug with source editor: when you close it, then create new source file, and then show source editor, newly created asmedit won't fit in the window, it will be smaller. IMHO creating new source file should make source editor visible anyway. IMO having separate main window and sourceeditor is better. I think I know what you're talking about, when hiding&closong the source editor and (don't remember exactly how I did) create a new file, and then show the source editor (via the menu). The edit child window isn't re-sized (as it is on first creation), I think simlply forceing it to resize if self after beein showed/re-created will be enougth to fix that bug. 4. View the source editor via teh View menu. Now you see something like attached image, note the asmedit controll isn't (re)sized to fill the void, resizing the window corects it. btw, I can't compile the samle file, it produces a null file with .com extension. please, where can I find the last realease of fresh? In the first post of this thread. The Fresh is attachment to the post. I god the problem. It is easy. I will fix it. Thank you. so let make it without arguments. This will be a really good IDE. Oh, there's only one place in Fresh source that needs to be updated: line 200 of fasm.asm file. Sizeof [String library] is: 915 bytes. Sizeof [JumpTo] is:    18 bytes. Sizeof [actions engine] is:        1820 bytes. Sizeof [action events] is: 1439 bytes. Sizeof [actions data] is:        2533 bytes. Sizeof [Initialized data] is:    5744 bytes. The fesh.exe comlier funcition is ok on win98. But in the Win2003, the complier result is 0 size com file. It meaned the fresh.exe can't support win2003. So I guest that you maybe recheck api compatibity on the win2003. Thank you for your reply. The troubles with compiling Fresh are because Fresh's stdcallex.inc uses new operator ` in fasm. This operator is available only in version of FASM 1.49.9 that is still not official. You can fix this by commenting lines with this operator, but you will lost reports for what functions are skipped because they are not used. BTW: Fresh have this operator in its compiler. About the bug for Win2003, I will check this, but any help will be appreciated, because I have no Win2003 to make real tests. Is this is only 2003 problem, or 2000/NT too? I have test fresh.exe on NT/2000, The behaivor are same as Win2003. The complier result is a 0 size com file. And in the NT, when I quit the fresh.exe , the system showed error message dialog. I can confirm the behaviour on 2k Pro (testen on two different machines), 0 size .com file. I uploaded (at the begining of the thread) the last version. I change some things in virtfiles.asm and I hope it will work under 2000/NT now. Please check it and send some response. It should now compile without errors "Copy of Fresh.asm" and also "examples/simple.asm"